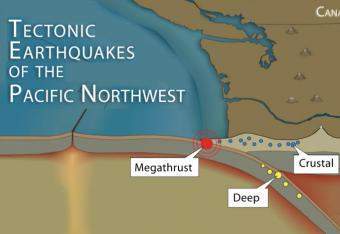 The Pacific Northwest is host to more than the anticipated megathrust earthquake that will happen off the Cascadia coast in the future. That earthquake will be due to the stress building between the Juan de Fuca and North American plates as the oceanic Juan de Fuca plate dives deep beneath the Pacific Northwest. However, there are also deep earthquakes within the subducting plate, and shallow earthquakes in the overlying continental crust. 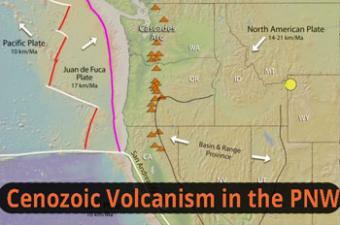 This is because of additional forces acting on the region besides subduction-zone processes. CLOSED CAPTIONING: A .srt file is included with the download. Use an appropriate media player to utilize captioning. Shallow crustal-fault earthquakes with magnitudes up to 7.5. Text from the animation—Word doc. no movement far inland above the deeper part of the diving oceanic plate. 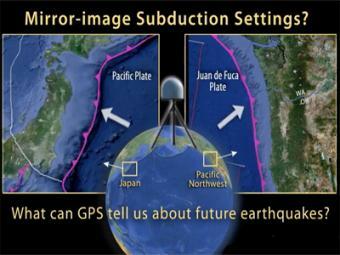 This UNAVCO animation compares Japan's subduction zone at the location of the 2011 earthquake with a mirror-image subduction zone in the Pacific Northwest. There are many similarities. The Pacific Northwest is host to three kinds of earthquakes revealed in this Flash rollover. 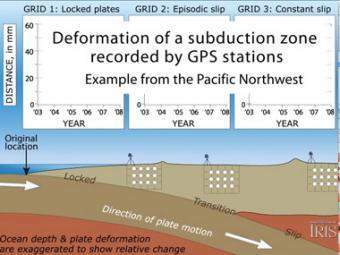 Subduction zone great earthquakes, shallow crustal quakes, and earthquakes within the subducting plate. 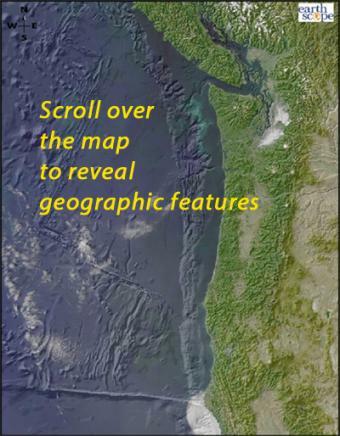 Scroll over the bathymetric relief map to learn about the geographic provinces of the Pacific Northwest. 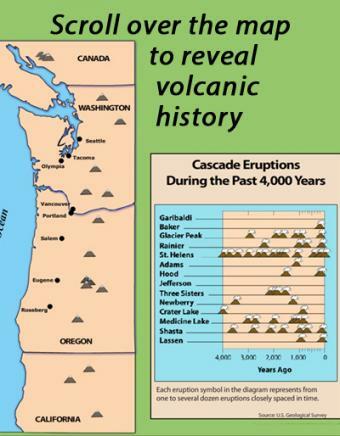 Learn about the volcanoes of the Pacific Northwest Cascade Range mountains by scrolling over individual volcanoes on this interactive map. 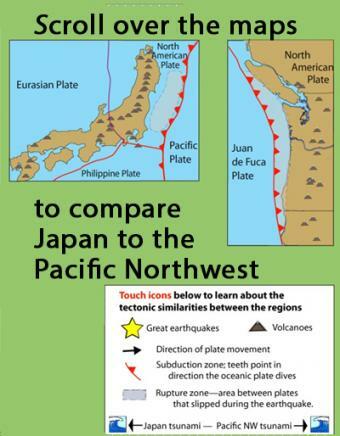 Learn how the Pacific Northwest tectonic setting and megathrust earthquake of January 1700 is similar to the catastrophic earthquake in Japan in 2011 by touching icons on this interactive map. 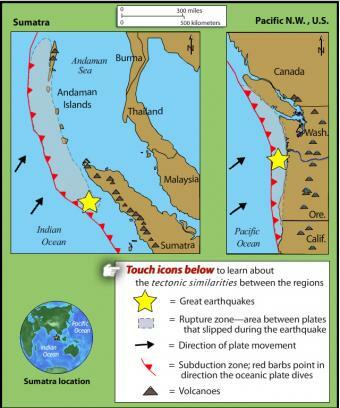 This rollover compares the an earthquake of 1700 in the Pacific Northwest with the 2004 Sumatra earthquake and tsunami. The tectonic settings are similar.